The post below is by my student Kat dos Santos. In addition to participating in my undergraduate “Performance Beyond Theatres” class at Western University last semester, Kat took part in a range of political actions on and off campus, including the one she describes in her post below. A version of this post originally appeared on Kat’s class blog in November 2014; I asked her if she would be willing to adapt it for The Activist Classroom because it represents “activism” in the space of teaching and learning in the truest sense: putting your body on the line for something you deeply believe in, and in order to share knowledge and spark debate with others. Not everyone reading this post will be in sympathy with Kat’s political perspective on Canadian Forces recruitment and military engagement (although I am: I sincerely respect all Forces vets and personnel, but am deeply critical of the way my government, and the governments of other Anglo-European nations, have in recent history used those personnel to unjust ends in unjust conflicts). I do hope, however, that everyone reading can respect a young woman writing passionately about, and standing up for, her convictions – as a part of her university education. On Tuesday November 18th 2014 I was part of a die-in protest with 6 other individuals at our university. 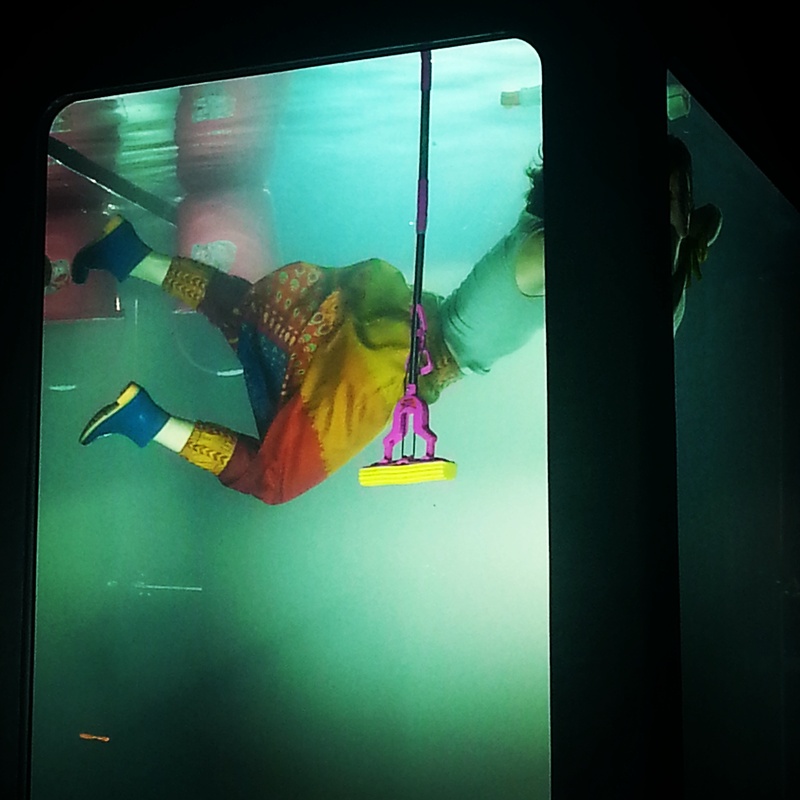 The nature of this protest performance was site specific; it took place in the university’s community centre, a central location that most students pass through during their day. We were on the ground for an hour and a half: five of us positioned ourselves directly in front of the Canadian Forces recruitment table, while a grey metal box containing white poppies and anti-war pamphlets was placed beside us (one offered information on the white poppy movement and quotations from veterans, and the other was a mock military recruitment pamphlet that offered an overview of the negative effects of engaging in combat to an individual’s mental health and personal relationships). Two other performers mediated the performance, engaging in conversation with spectators and distributing pamphlets while we, the “dead”, were stationary. We started the performance by filing in one by one, dressed all in black with white painted faces, and as each of us laid down, one of the mediators drew a white chalk outline around our bodies. Pamphlets, as you can see from the above photo, were also strewn across our bodies, and some spectators would venture near enough to pick up and read the information they contained while others remained at a distance and looked on silently, or with some audible commentary. This was the extent of our interaction with spectators: those of us that were “dead” lay immobile and unanswering to those that tried to initiate conversation. Some students tried to speak with us; at the very beginning I remember one male voice angrily asking us why we were doing this. Our justification was only to be found in the text surrounding us, and through our live-body mediators. This person seemed to want an answer from the dead bodies, though, because it was our very performance of being strewn across the floor which seemed to anger him. He spoke down at us for awhile, speaking of his war-veteran grandfather, before moving on. While on the ground I also overheard a student tell the recruiting officer how perfect the military would be for him: he has always wanted to backpack, but, well, here he is at school. I started to understand how the Canadian Forces might offer an alternative to the restrictions our neoliberal society imposes on us, including the enormous debt with which a university education saddles many of us. Education, travel, and service: the best part is you don’t have to pick just one. At this point I need to say that I am not proud to be part of a system that devalues education by turning it into a debt sentence – a debt sentence to be resented as something that limits an individual’s ability to pursue other avenues of experiential growth. A university degree becomes just a piece of paper that proves you did your time. University should open up opportunities of exploration; it should not be the reason I must make choices that confine me to one geographic place, or to a job I might hate. An organization like the CF that asks us to enlist so that abominable acts of violence can be committed, often while eluding full justification, tells us in their on-campus recruitment drives that education is nothing more than a means to an end, and that we are of no value to society beyond being a body. Recruiting officers aren’t going to emphasize my likelihood of developing PTSD, the strained and stressful relationships with my loved ones, or my 3x increased risk of suicide, all of which might result from time spent in active combat. A recruitment officer is not going to situate me as being an extension of a larger ideological, capitalist agenda that may in fact be contributing more harm than good to the world. The promotion of a pro-war, utilitarian mentality reduces us to the status of passive, ‘student’ consumer and disempowers us as individuals who seek social change. During the die-in I decided to have my eyes open for about the first quarter of the performance. I had thought that it might look especially eerie while I was lying on the ground. I couldn’t see anything except the ceiling overhead, but I thought it would speak to the idea of soldiers being conscious agents themselves, and not just an extension of a larger ideological agenda. Those choosing to join the military often view their agency to be an expression of patriotism and social good. There are those who join the military and do not necessarily need the financial benefits; they may actually consider the implication of our performance, that the military is taking advantage of “poor” students, to be insulting. Those of us who participated in the die-in had the benefit of continuing a dialogue with some spectators who felt this way through social media afterwards, so were privy to the wide-ranging backgrounds and differing opinions that had emerged concerning our action. If we had allowed the Canadian Forces to have a presence on our university campus without any opposition, the value of our academic space would have been undermined by a lack of public debate about the issues the CF booth raises; instead, our action produced a discussion, of which I’m proud. Military combat should be questioned, and the consequences seriously considered. Your right to choose to enlist should not override your questioning of war itself. I think this performance is ultimately categorized as site-specific, and it is this specificity that makes it politically charged. It opens up a discourse that suggests all students are implicated in war. During our action the military booth was sidelined so that only those truly interested might approach it unimpeded, but our occupation of space in the path of all students entering the community centre demanded, on some level, full spectator engagement. It was not a performance that one could’ve chosen to attend: it was imposed upon all who entered, and they were forced to decide for themselves upon a reaction and opinion. The encroachment of this performance on the student body at Western is what made it controversial, and what incited many to scorn the very performance regardless of what it represented (because of its disruption to their daily routine, or of some notion of respectability). I need to acknowledge that our site-specific demonstration also became a force that turned away many from perhaps seriously engaging in a conversation about war, because they were caught up in the logistics and “politics” of our unsanctioned presence. I think our mediators were necessary to the performance because they eased spectators into voicing their reactions, and by inviting conversation they clearly demonstrated the aims of the performance, alongside our visual and visceral presence. The mixed responses from students to our die-in especially made me keen to justify the importance of our action by highlighting why it was necessary to execute this action at school, and not simply keep our anti-war campaign to more “public” ground in other parts of town. 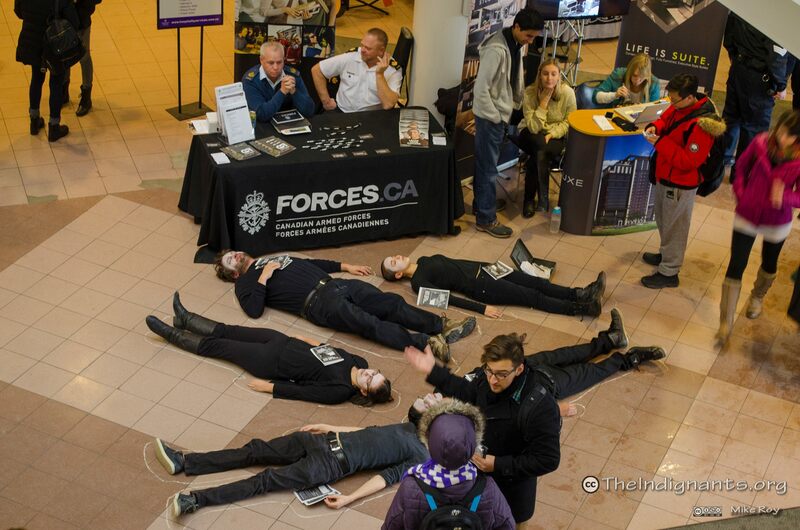 The staging of the die-in, framed within the UCC, ultimately operates on the assumption that students have – should have – real ownership over this space, despite the Canadian Forces’ rental of recruitment space from an increasingly corporate educational institution. If you want to check out some more of my recent encounters and engagements with social justice efforts check out my blog, “No one/ bears witness/for the witness”. Having a class with Kim last semester definitely inspired me to frame these demonstrations using performance theory, making it all the more laden with meaning and intention; having more purpose behind the action makes it potentially more politically powerful. Peace and thanks! The brand-new Theatre Studies program at my school, Western University, is off to a roaring start. We’ve got a small but mighty crew this first year, plus lots of interest in the wings for next. We’re not rich, yet we’re full of promise – which means we’re also making do with what we’ve got until we’ve gathered enough momentum to attract fresh investment. That is, we’re using found spaces to make performances, we’re Skyping in artists, and we’re taking every opportunity to leave campus in order to see good theatre and performance work in our own and nearby cities. Twice recently I’ve taken small groups of my Theatre Studies students on field trips to fairly unique performance-related events; these trips have reminded me of the pleasures of leaving traditional teaching spaces behind in order to learn from, among other things, the precariousness of being out in an environment I can’t fully control. Last October, I drove (I drove!) 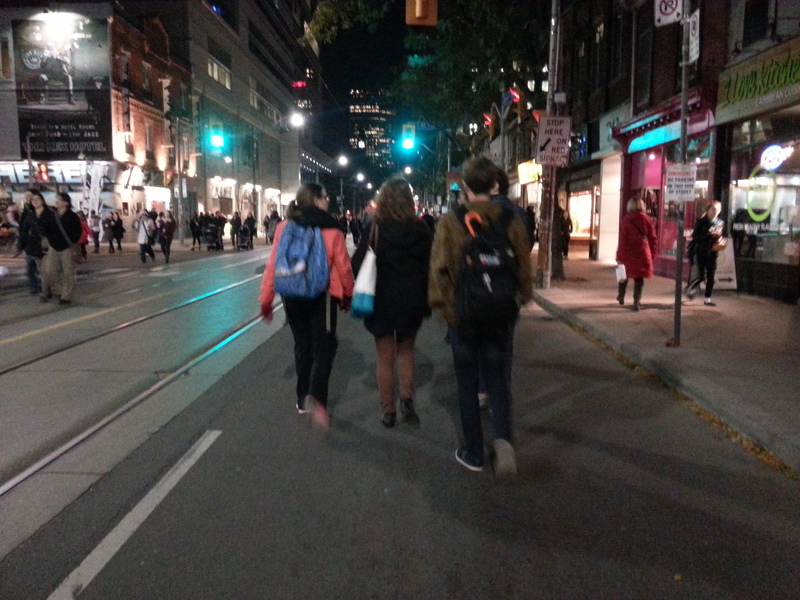 to Toronto with six students from my Performance Beyond Theatres class, where we spent 7pm through 1am taking in the city’s annual Nuit Blanche all-night art festival. The seven of us – Sarah, Caitlin, Reggie, Rita, Jonas, Kat, and I – parked, ate dinner, and then wandered the streets with a basic road map of performances we’d starred as worth visiting. We sought shelter in the city’s underground PATH network as the temperature dropped, discovered an extraordinary installation performance in a parking garage – Vertical City’s 2uTopia – and then found ourselves willingly shivering and chattering outside once more, as we stood awe-struck before another gorgeous installation about the precariousness of labour and the ravaging of the environment in the global marketplace (Lars Jan’s HOLOSCENES). I’m convinced that the rhythm of our meandering made all the difference to the learning experiences we had that night. 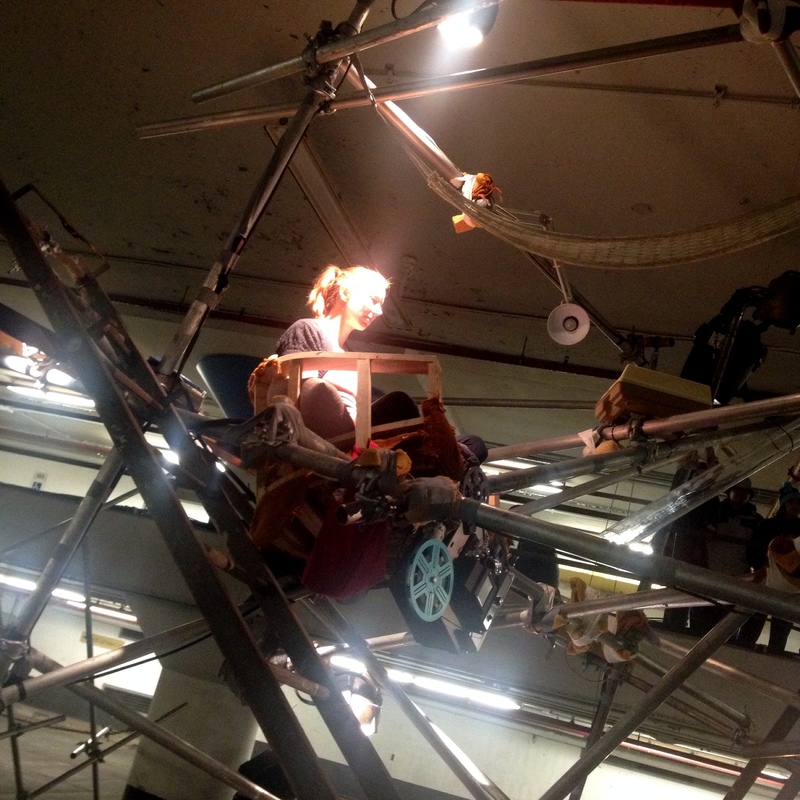 Figuring out where to look, what to look at, what to make a note of, and what to dismiss was the basis of our labour as artists, advertisers, retailers, and fellow spectators clamoured for our attention. I was as new to all of it as the students: despite the fact that I have been to Nuit Blanche many times before and am adept at navigating downtown Toronto, where I used to live, I was no more sure than they were whether or not, for example, the trim woman in the fancy yoga trousers meditating in a bubble was a piece of “real” art, or a shill for Lululemon. We had to figure it out together, and once we had (yup, it was advertising) it became a teaching moment: I explained the relationship between performance art and yoga pants as commodities in the “creative city,” and we proceeded to debate, as we walked on, whether or not art and retail could or should coexist at a festival like Nuit Blanche. Not all of our outings are to see performance proper, though. This afternoon I drove two of those same students, Jonas and Sarah, back to Toronto to take part in a colloquium at the University of Toronto’s Centre for Drama, Theatre, and Performance Studies. I’d been invited to give a talk as part of the event, but the timing conflicted with the History of Performance Theory class I’m offering this term. Since the class was working on just one text this week I thought it would hardly matter if I cancelled just once; I also thought, however, that the students should have the option of coming with me to the Drama Centre. After all, I’d be speaking on a subject – feminist performance theory – directly related to our work in the class. And I’d be doing it in the very room where I took Performance Theory myself 15 years ago. A full afternoon’s field trip is a big commitment, and some of the students in the class did not feel comfortable missing other classes for an outing that was not, strictly speaking, required. But Jonas and Sarah were game, and I’m glad they came. Not only did they have the chance to sit at the long seminar table with a group of Master’s and PhD students and faculty, listening to both talks on the agenda and to the wide variety of questions posed during the Q&A, but they were also able to observe how other participants were behaving in this semi-formal academic environment. Knowing that they would be attending along with upper-level students, I prepared my talk with a heterogenous audience in mind; the excellent senior PhD student who presented alongside me, meanwhile, gave an exceptionally clear presentation that inspired both Sarah and Jonas in its style as well as its content. On the way home we talked about it, as well as about the techniques of other teachers they’d had who were especially good at sharing complex information with a student audience. From their feedback, as well as from my fellow presenter’s clear style, I learned a great deal myself from today’s experience. Leaving campus is like skiing off-piste: you’re in uncharted territory, even when you sort of know where you’re going, and you need to be ready for unexpected stuff to happen and, when it does, to adapt and regroup. That’s a bit nerve-wracking, of course, but it’s also refreshing and freeing. Thanks to having my students at my side I learned more from both Nuit Blanche and today’s colloquium than I would have done alone; they noticed things I might not have otherwise noticed, and thanks to my reactions to their reactions they thought harder and longer about stuff they might otherwise not have stopped to reflect upon. For all of us, then, a win-win.